Rowland, G.g.. "Flax". The Canadian Encyclopedia, 04 March 2015, Historica Canada. https://www.thecanadianencyclopedia.ca/en/article/flax. Accessed 23 April 2019. Flax (Linum usitatissimum), annual plant belonging to the family of the same name (Linaceae). Flax is sown and harvested much like a spring cereal crop and matures at the same time as wheat. Flax (Linum usitatissimum), annual plant belonging to the family of the same name (Linaceae). Flax is sown and harvested much like a spring cereal crop and matures at the same time as wheat. The flowers have 5 petals (usually blue but sometimes white) and produce a boll (fruit capsule) with up to 10 small, flattened, ovate seeds 2-6 mm in diameter. Mature seeds contain approximately 40%oil, 25% protein. The oil is notable for its high proportion of alpha-linolenic acid, which often exceeds 50%. The seed coat is usually brown but some varieties are yellow. Although the place of origin of flax is unknown, it was likely in the Near East. Flax was cultivated in ancient Egypt, where its stem fibres were used to produce linen cloth. Oil crushed from the seed (linseed oil) was initially a byproduct of linen-fibre production, but with the Industrial Revolution it came into demand as an industrial drying oil (eg, in paints, steelworks, linoleum and oilcloths). By the 20th century, flax was grown primarily for oil. In Europe, one type is produced for linen fibre, used in producing linen cloth, and for industrial purposes where toughness under water and in corrosive conditions is required. 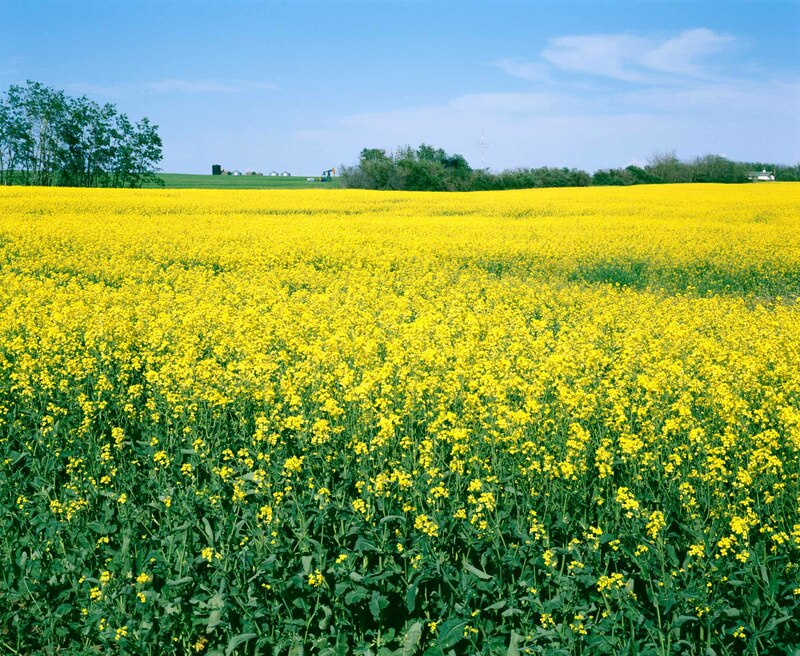 In Canada, flax is produced only as an industrial oilseed crop and is grown annually on between 300 000 and 700 000 ha in western Canada (most of which is in Saskatchewan). The average yield is approximately 2000 kg/ha. Some seed is crushed in Canada for the domestic paint industry, but most is exported to the US, Europe and Japan. The meal, which remains after crushing, is used as a protein supplement in animal feeds. Flax seed is also used as whole or ground seed in a wide range of bakery goods. Flax straw can be processed to produce fine paper used primarily as cigarette paper since it is clean-burning and tasteless. The fibres are also used in paper money, giving it toughness. A new type of flax named solin has been developed for the edible-oil market. Solin is defined as flaxseed whose oil contains less than 5% alpha-linolenic acid. Solin oil closely resembles sunflower seed oil and is a light oil suitable for salad dressings, cooking and margarines. In Canada, solin must also have a yellow seed coat. Other than the oil composition, all other characteristics of solin remain the same as traditional flax.